New Delhi, India -- IT is fascinating how philosophic and cultural ideas spread freely in ancient times across formidable barriers such as mountains and oceans. Ideas can have a life of their own and it is often impossible to contain them within national or geographical boundaries. One of the greatest stories of the diffusion of ideas is that of Buddhism, which spread right across the Asian continent. 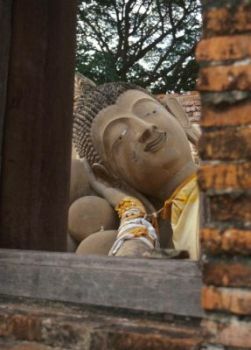 << The Buddha, Ayuthaya, Thailand. Amid the ruins of the many temples of Ayuthaya are sculptures that remind us of the past glory of this holy site. The ancient Indic vision of life is one that is filled with compassion. It sees a oneness in the whole of creation. The separated forms of the world are considered to be maya, or mithya, illusions perceived through our subjective and limited sensibilities. Our belief in our separate identity and ego is the greatest illusion. It keeps us bound to desires and attachments in the material world. It is a life of pain, as none of our illusory goals can bring us happiness. Peace and joy can only come through the shedding of desires. All human beings are aware of the pain of life in this world. Thus, this philosophy was received with open arms wherever it travelled. It had a transforming influence in all the countries that embraced it. The culture of a continent was shaped by this deeply ethical vision. This philosophy also took with it the marvellous concept of deities. In the Indic philosophy of aesthetics, it is believed that the moment of the aesthetic experience is akin to the final bliss of salvation itself. Our response to beauty is seen as our perception of the grace that underlies all that there is. The moment we experience beauty, we are transported. For that brief instance, we have lost our material desires: we have perceived that which is beyond our illusory concerns. Accordingly, early Indic philosophy and art constantly present the beauty of sublime deities before us. Deities are personifications of ideas and qualities. The qualities, such as wisdom, compassion, kindness and courage, are within us. We look upon their representation in art: we focus our attention upon these, until they are awakened within us. These grow and fill us completely. 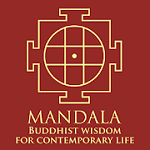 This philosophy, carried in Buddhist and Brahmanical faiths, spread through the whole of Asia in ancient times. Traditions of art sprang up everywhere in order to create sublime deities to aid us on the path of enlightenment. A vision of life was established, which looked always beyond the material world, to the peace that was eternal. In ancient times, India traded considerably with countries in the Mediterranean region, West Asia and South and South-East Asia. This led to a great spread of ideas. There are inscriptions relating to Greeks who became Buddhists and Brahmanical devotees in the B.C. and early A.D. periods. There were large colonies of Roman settlements in India. A landmark in the culture of Asia was Emperor Asoka’s daughter Sanghamitra’s journey to Sri Lanka with the message of Buddhism in the 3rd century B.C. The faith was accepted with great warmth in the island. 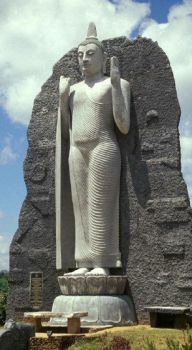 In centuries to come, Sri Lanka became the centre of the early form of Buddhism, known as Theravada Buddhism. << The temples and stupas of Bagan, Myanmar. Bagan, with sublime sculptures and paintings, is one of the great Buddhist sites of the world. The earliest paintings of Sri Lanka are found in a cave, high atop the massive Sigiriya rock. The 5th century Buddhist paintings of Sigiriya, in their graceful lines and deeply thoughtful expressions, carry forward the traditions of art seen at Ajanta. There is close similarity between the paintings of Sigiriya and those of the later period of Ajanta. They were contemporaneous. The figures have an inward look, which pervades the Indic art of this period. The painter’s gentle touch shows us that he is filled with sympathy and compassion for humankind. These paintings, through their lilting grace, remind us that there is an end to the sorrow of the world. In the 12th century, the Chola kingdom covered South India and parts of Sri Lanka. The styles of the end-10th century paintings seen in the Brihadisvara temple in Thanjavur are closely reflected in Sri Lanka. The 12th century Buddhist murals at Polonnaruva portray the Jataka tales, the stories of the previous births of the Buddha. These tales embody the norms of ethical living and were the chief vehicle for conveying them in the early form of Buddhism. We see representations of the Jatakas in Buddhist art from the Bharut (Madhya Pradesh) stupa railings of the 2nd century B.C. onwards. 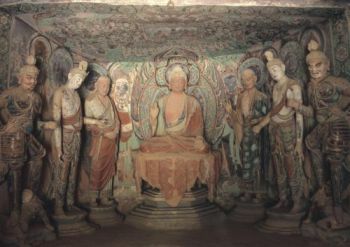 Buddhism has a long tradition of rock-cut caves. These were perhaps used for meditation and as residences of monks. Since ancient times, the walls of these caves were profusely painted and sculpted. Sri Lanka has preserved and nurtured the ancient tradition of cave paintings. The sanctity of the secluded interiors provides an atmosphere of peace, far from the clamour of the material world. 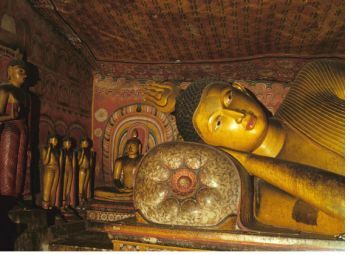 The caves at Dambulla have sculptures and paintings from early times up to the 18th century. Myanmar was a great crucible of Buddhist influences and art that came to it over the centuries. At the end of the first millennium, Myanmar had a deep relationship with the centre of the Buddhist faith at Bodh Gaya, in Bihar, where the Buddha attained enlightenment. In fact, the architectural form of the Mahabodhi temple at Bodh Gaya is followed in the 11th and 12th century temples that were built in Bagan. By the 12th and 13th centuries, with the decline of Buddhist centres in the plains of India, scholars and artists from India took refuge in the deeply religious sanctuary of Myanmar. Bagan became a sanctified place with thousands of pagodas. The inspirations for this art came both from eastern India and from Sri Lanka. The 12th century paintings on the inner walls of these pagodas are some of the finest and gentlest paintings of the entire Buddhist tradition. The themes are from the life of the Buddha and from the Jataka stories. From early times, Thailand was influenced by Indic philosophy from Sri Lanka and Myanmar. Contact with neighbouring Cambodia and overseas trade with India brought to it the traditions of the worship of Hindu deities. The culture of Thailand developed as a marvellous synthesis of the Brahmanical and Buddhist influences coming from many sources. The predominant faith of the Thai people is Buddhism and one of their strongest cultural traditions is that of the Hindu epic Ramayana, or Ramakien. The temples of Bangkok and other places in Thailand present a marvellous blend of Buddhist and Hindu traditions. They are dedicated to the Buddha and their walls are elaborately painted with scenes from the Ramayana. The division of Indic faiths into different religions, Buddhism, Hinduism and Jainism, is a relatively recent phenomenon. European colonisers and scholars, whose understanding was based upon their knowledge of the sharply divided Semitic faiths, could not appreciate that belonging to any one of these faiths did not preclude puja (adoration) of the deities of others. Since early times, the kings of the Tibetan plateau turned with a great eagerness and zeal to India, to imbibe the sacred faith of Buddhism. The Sanskrit script was taken to Tibet to prepare the basis of the Tibetan script. In the 8th century, Santarakshita from the Nalanda university made the first Buddhist temple in Tibet (Samye, based upon the architectural model of the Odantpuri Mahavihara in Bihar) and laid the foundations of a monastic order there. He appealed to Guru Padmasambhava, also of Nalanda, to visit Tibet and help enlighten the people about the new faith. Padmasambhava, who was teaching in Kashmir, brought with him the Cham, the spiritual dance of Vajrayana Buddhists. This dance is believed to purify the land and drive away all evil spirits. It also celebrates the victory of good over evil: man’s conquest over his ego, which binds him to negative and worldly desires. The period of Guru Padmasambhava is known as the First Great Diffusion of Buddhism in the Himalayas. To this day, the guru is the most revered teacher for all Buddhists in the region. 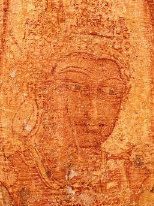 << Bodhisattva, Mural, Polonnaruva, 12th century A.D. The gentle expressions on the faces of the Bodhisattvas carry forward the finest traditions of Buddhist art. These paintings are among the masterpieces of medieval Buddhist paintings in Asia. In the 10th century, Yeshe ’Od ascended the throne of Guge, which included Ladakh, Lahaul-Spiti, Kinnaur and western Tibet. By then, Buddhism had declined in Tibet. What troubled the king most was that even the little practice of the faith that continued was incorrect and full of local magical rites. Yeshe ’Od sent Rinchen Zangpo and other scholars to Kashmir to bring back scriptures with the true knowledge of Buddhism. These were translated into Tibetan by Zangpo, who became famed for all time to come as Lohtsawa or the Great Translator. Rinchen Zangpo continues to be revered in the Himalayan region. In fact, in the minds of the people, he has been transformed from a historical figure into a divine being with magical powers. Yeshe ’Od and his successors built a chain of 108 monasteries across Guge. These were painted and sculpted by artists who were brought from Kashmir. This period is known as the Second Great Diffusion of Buddhism in the Himalayas. These monasteries became the foundations of Buddhist culture and art. The Himalayan country of Nepal has preserved both Buddhist and Hindu traditions over the centuries. It has some of the grandest early stupas, which are worshipped even today. Nepal is geographically close to the cultural centres of the Indian plains, and there is a great heritage of philosophy and art that Nepal has shared with India over the centuries. With the disruption of Buddhist centres in India by the 12th and 13th centuries, large numbers of monks and scholars took refuge in Nepal. They carried with them their greatest treasures, their valued manuscripts and paintings. From across the Tibetan plateau, Nepal also received the concepts of Kashmiri Saivism. The valley of Kathmandu was like a crucible where the philosophical ideas from eastern India met those from Kashmir. Buddhism and Hinduism in Nepal appear similar and there are no definite lines to separate them. At the Swayambhunath Stupa in Kathmandu, we see many Siva-lingas with Buddhas carved on them. A massive vajra (thunderbolt) made here represents the Vajrayana form of Buddhism. Bhutan, the small mountain kingdom, has maintained its seclusion and the privacy of its Tantric Buddhism. Guru Padmasambhava is believed to have descended here on the back of a flying tigress. He cleansed the land of the evil spirits that hindered the spread of Buddhism. Even today, he is the most beloved deity who is worshipped in his many manifestations and forms in Bhutan. Bhutan has preserved the sanctity of the art of religious painting. It is the one land where paintings are made with deep reverence and meditative care. As in the ancient tradition, the aim of the painter is not to make a work of art; it is an act of faith to represent with devotion the aspects of eternal truth. Buddhism travelled on the Silk Route from India along with caravans of goods. It went to China from Central Asia, through Pakistan, Afghanistan and Uzbekistan. Around the dreaded Taklamakan desert is a string of oases, the source of life in the arid lands. These have many Buddhist caves, which mark the early progress of Buddhism and Indic art to Central Asia and China. << Dunhuang, Mogao Cave No. 45. Seated Buddha in the main shrine, with a group of monks and protectors. The statues are painted, as were all sculptures in ancient Indic traditions. Almost 500 caves survive at this vast site, which has one of the largest treasures of Buddhist art in the world. The names of great scholars and translators illuminate the passages of the Buddhist history of China. The most outstanding of these was Kumarajiva of the 4th century. He was the son of a Kashmiri Pandit, Kumarayana, and Princess Jiva of Kucha. At the age of nine, his mother brought him to Kashmir where he studied Buddhism for many years. On his return to Kucha, he translated more than 40 important Buddhist texts, including the Lotus Sutra, into Chinese. These remain the most important texts of Buddhism in China and Japan. Buddhism and its art were accepted wholeheartedly all over Central Asia and China. From here, the message of the Buddha travelled further to Korea and Japan. In the far-east, Japan is the most distant land that received the influences of Buddhism and Hinduism. The philosophy of deities and aesthetics, which was developed in India, has been nurtured in Japan. 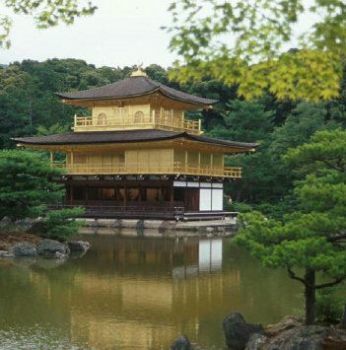 More than any other in the world, the culture of Japan is sensitive to the beauty of everything that is around us. The effect of peace and harmonious feeling that this appreciation of beauty brings to people is best understood in Japan. 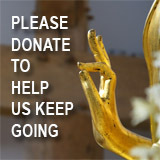 Buddhism is a great culture of peace and ethical living. This is a vision of life that takes us away from the noise and painful confusions of the material world: it teaches us to shed our desires for illusory attractions. Its message is to look within, to the great peace and joy that are to be found there. Like all Indic faiths, this is a message of universal love and does not preclude the adoration of deities of other faiths.